It's official. My sanity flew the coop. Six teeny, tiny, fluff-balls of joy joined the craziness of our lives. Yes, our Animal Whisperer prevailed. 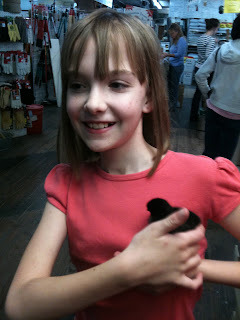 After months of pleading, pouting, and persuading, Kiki is now Mama Hen to six pullets. For those of you non-chicken-obsessed people, a pullet is a female chicken. Somehow, I thought a rooster would not earn us a “good neighbor” award. 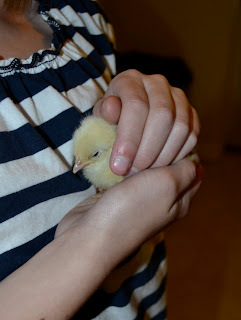 I was unprepared, however, for the sight of sleeping chicks. Do you know that when chicks sleep, they look like dead chicks? I went downstairs to check on the babes, saw them sprawled out in the pine shavings, thought the heat lamp had cooked them, and frantically shook the box. They popped up and began peeping at me. It's like new mother syndrome. You pray your baby will sleep—but then need to wake her to make certain she's breathing. 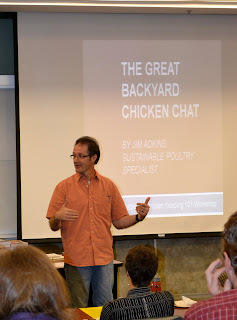 Tomorrow, or sometime soon, I'll write about the preparation needed for backyard chicken keeping. Right now, though, I need to wake the babies.